Friends of Music and Art of the Scarsdale Schools: SHS Drama Club presents Bye Bye Birdie! Come enjoy a charming musical theatre classic! 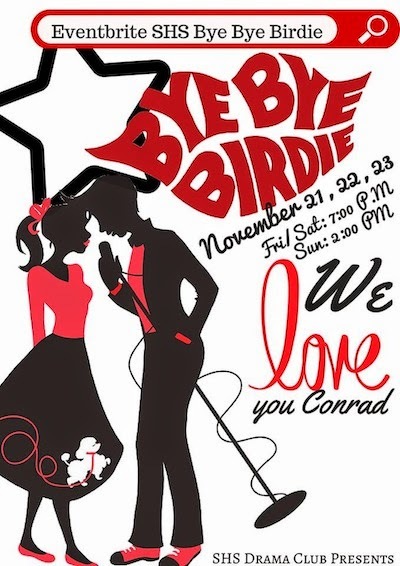 Bye Bye Birdie is one of the most captivating and funniest Tony award winning musicals of our time. An uproarious, laugh-a-minute show, with a cast of lovable characters you won’t soon forget. So, don’t miss seeing the MacAfee family and the residents of Sweet Apple, Ohio, go topsy-turvy when the hip swinging, teen idol Conrad Birdie comes to town to serenade one lucky fan before he enters the Army. A fabulous musical for all ages.